When looking at an image in a directory with the Preview application, I'm used to the Windows behaviour of using the ←/→ keys to move through all the other viewable images in that directory. Preview.app doesn't do this - I first have to select all the images and then open Preview.app. This is a little annoying. Is there something I can turn on or install to get this behaviour? 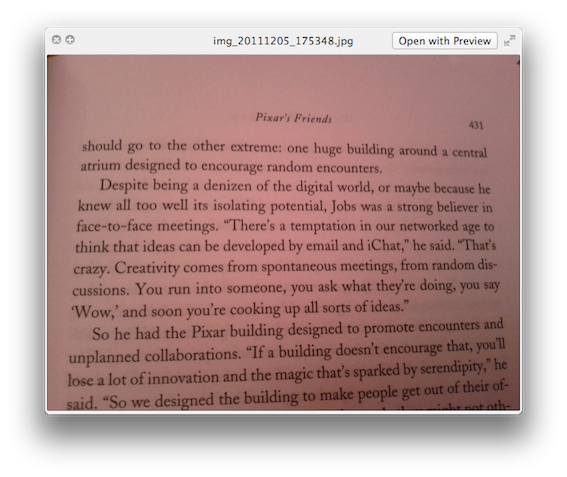 Also, how do I open an image in a new instance of Preview.app, say for comparison purposes? Instead of opening a picture in Preview.app by double-clicking it, just press space to preview the picture when selected in Finder. This way you can still use the arrow keys to navigate between the pictures. You can still open the picture in Preview.app when needed (top right corner). Select all of the photos by pressing " Command + A" and then right click "open with preview" it will open all of your selected photos and you can scroll through them! Preview can be used for much more than just a quick glance at an image file when you get out of the habit using it like on a Windows machine. To open up the power of Preview, I keep it on the dock so it is handy all the time (doesn't have to be open and running). Select the group of files you want to see, or just drag the whole folder to the dock, and drop on Preview. Check in Previews presences under the General tab and check the "Open groups of files in same window" is checked. 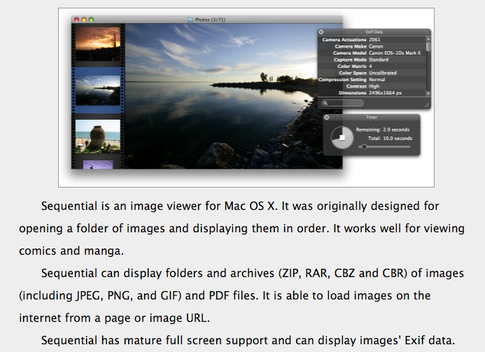 Preview will open with all the images in a side bar and some buttons will appear on the bottom right in OSX before Lion. On Lion there wil be buttons at the top by the Search box. Before Lion one of these buttons is "Contact Sheet"; when you click on it a Slider will appear and you can adjust the size of the thumbnails. In Lion one is called thumbnails and you can drag the divider bar to change the size. By dropping multiple files on Preview you can now do batch operations too, like adjust the size, or flip and rotate. You can easily crop images and do color adjusts in Preview as well. Preview does more than these things too if you will spend a little time learning about it. To open an image in a new window after you have done the above, just right click on the image in the side bar and choose "Open in a new window". You could also try Sequential. The last update was in 2010, but it's still less buggy than Preview. I recommend using Xee instead of Preview, and that will allow you to jump from photo to photo in a directory after only opening one. If you wish to change Xee to the default photo viewer, just right click on the file with the type that you want to change the default for, choose "Get Info", and select "Xee" under open with. Then, press "Change All..."
To answer your second question, you can open a new instance of Preview by opening one image, then double-clicking and opening the second image. Preview automatically realizes that you want a new instance (that is, of course, if Preview is your default application for that file type). Preview will open a window, displaying all the images in the folder, with a sidebar of thumbnails. Use the up and down arrow keys to navigate. I'm using Preview on High Sierra. Select all of the pictures in the directory at once and double click them. That will open them all up in Preview at the same time, and you can use the down/up arrow keys to view them sequentially, just like you mentioned in windows. Open the directory & select all pictures using - "⌘ + A"
Wow! How can people be so ignorant of what they are using? Click on any image in the Finder window, hit the space bar then use the up and down arrow keys to preview all the files, you can even browse through individual pages of unopened pdfs, word, pages etc. Pop down into folders and back up by adding command to the up/down arrow keys. Alternately open Quikview in Finder and simply side scroll through all the files, using mouse, keyboards, touchpad anything. macOS leaves Windows in the dust both for easy of view and quality. It has keyboard shortcuts you are looking for. Not the answer you're looking for? Browse other questions tagged macos preview . Why does Preivew.app automatically change the saturation of some images?